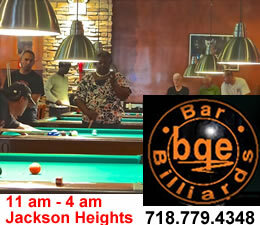 March 27, 2018 / Sunnyside Neighborhood / Queens Business / Queens Buzz NYC. 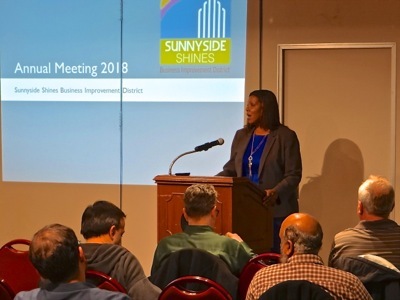 On Monday, Sunnyside Shines, the Business Improvement District organization serving Sunnyside held its annual meeting. 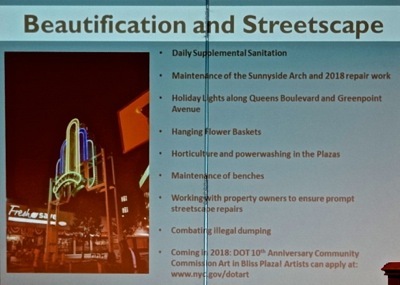 The Sunnyside business improvement district includes Queens Blvd between 38th and 50th Streets and along Greenpoint Avenue from 50th to 42nd Streets and most points in between. As you can see from the photo at right, the meeting was well attended. Somewhere in the neighborhood of fifty to one hundred people spent some time at the meeting, and I found it to be pretty informative regarding what's going on in the Sunnyside business community. Sunnyside Shines BID Executive Director, Jaime-Faye Bean was there to present the BID’s annual results and she,along with John Vogt, Chairman of the Sunnyside Shines BID also presented a number of awards to community members for their contribution to the business district. One of the things that struck me as I watched the events of the evening unfold, was the holistic approach to business development that the Sunnyside Shines BID had undertaken this past year. It struck me not just because there were so many people in attendance, but because of their enthusiasm, their achievements and the BID achievements in building momentum for the business district as a whole. You’ll see more clearly yourself as I describe the night. 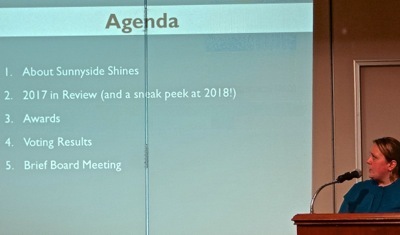 CLICK HERE for a photo slide show of the Sunnyside Shines BID meeting awards and business improvement statistics. March 27, 2018 / Sunnyside Neighborhood / Queens Business / Queens Buzz NYC. Continued. PA James was followed by David Shin who handles small business microloans for the government. He mentioned a couple of small business loan successes, including one for a sauce maker in Jamaica, where the recipient borrowed $10,000 that they weren’t able to obtain through traditional lenders. We were told that they received the loan at 0%, but Shin didn’t tell us how long the term of the loan was. He went on to say that the sauce maker has recently been accepted as a vendor into Whole Foods. Sunnyside Shines BID Executive Director, Jaime Faye-Bean, came to the podium to begin her presentation of the Sunnyside Shines BID annual results. 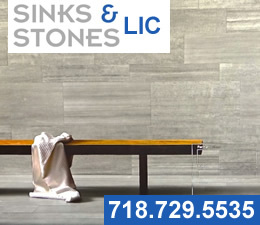 She noted that Sunnyside Shine BID membership grew 85% in the past year and that there was a 40% growth in BID membership in the Residential Class C category. The Sunnyside Shines BID also added ten new members. 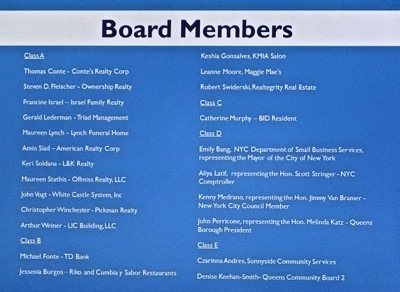 And twenty-two Sunnyside businesses sponsored street banners last year. The money received from those sponsorships goes back into improvements in the streetscape. My interpretation of this was that Jaime and John were evolving the Sunnyside Shines BID community in a holistic, inclusionary manner. Jaime went on to tell us that the Taste of Sunnyside sold out last year and that this year it was moving to a new venue – the P.C. Richards Parking Lot off Queens Blvd just east of 50th Street. And the date was May 22nd and tickets were now available at http://www.sunnysideshines.org/taste-sunnyside. 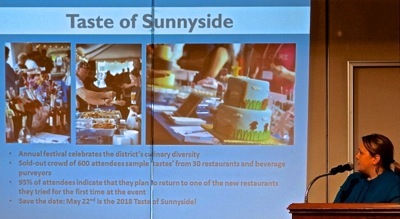 Click here to view some of our coverage of the Taste of Sunnyside event last year to get an idea of what to expect. Jaime went on to tell us that the Sunnyside Shines BID had developed a Welcome Kit of which they had distributed over 9,000 to new and existing residents at the Sunnyside Plaza events, through realtors offices, hotels, Queens Tourism and Sunnyside Community Services. There were 18 weeks of performances in Bliss Plaza at Queens Blvd and 46th Street underneath the subway line, sometimes greeting commuters home from a long day of work. The events were used to showcase local performance talent, and as mentioned above, they used the events to distribute information about the local businesses. Jaime said that over the course of the program she began to recognize some of the elders returning to get good seats before the show. Jaime said that this year the Queens Borough Dance Festival will do TWO performances, that Paul Maringelli’s Bix Biederbecke memorial concert is slated for another return engagement, and the popular Afro Latin musicians that performed at the Taste of Sunnyside last year will also be returning – but I wasn’t sure if it was specifically for that event. 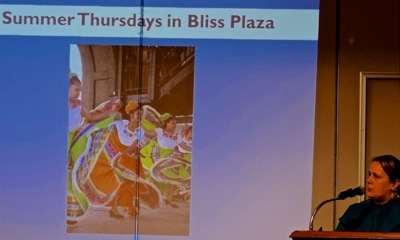 The Bliss Street performances will be held on Tuesday afternoons, as businesses noted that might be a better day slot than Thursday, and the first performance begins May 1st. The programming at Bliss Plaza at 46th and Queens Blvd on Tuesdays is being renamed this year to Beats. 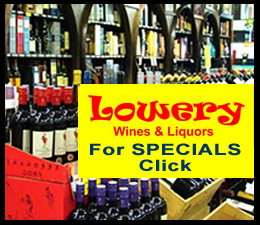 At Lowerys Plaza there were nine weeks of Health programming. Jaime told us that the Zumba at 10 am on Saturdays turned out to be a big hit. This year a local Sunnyside cultural historian has volunteered to do Queens Walks which will be publicized along with the rest of their programming on their website at http://sunnysideshines.org. 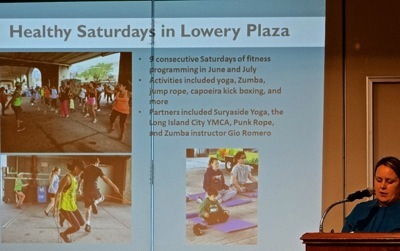 The programming at Lowerys Plaza at 40th and Queens Blvd on Saturdays is being renamed this year to Mid Summer Moves. 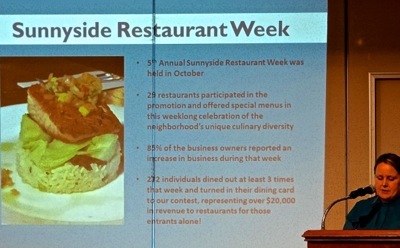 Restaurant Week was held in October of last year and fully 85% of Sunnyside Shines BID restaurants reported an uptick in business. 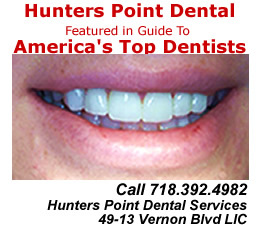 The BID’s frequent diner's card was associated with about $20,000 in business. This program will return in 2018. The holiday trolley was also a big success. The trolley began operating on Small Business Saturday and returned a week later. There were 1,200 riders and a passport was handed out to them, as well as to the folks who attended the holiday tree lighting on November 21st. As for street cleaning and improvements, 637 bags of trash were collected, 46 flower baskets maintained, 108 illegal graffiti works removed and an effort to stop some of the illegal dumping in the neighborhood met with some success. There’s a Mulching event on April 28th, 2018. Jaime complimented her staff and numerous volunteers for their help in making the BID so successful. Amy Cho was an Associate of Merchant Resources and during her internship with the BID as a Neighborhood 360 Fellow, she conducted a survey to find out what businesspeople within the community were looking to the Sunnyside Shines BID for help. Amy's findings included some of the following factoids. About 36% of respondents weren’t aware of the Sunnyside Shines BID responsibilities. The largest category of businesses in the Sunnyside Shines BID district were restaurants and bars, the second and third largest categories were retailers and service providers including folks in the beauty, medical, food, realtors and professional services. About two thirds of the businesses were happy with the BID support, while 28% didn’t know. A full 78% want help with marketing, about 40% want help managing the streetscape and about 25% said they would like help with financing. 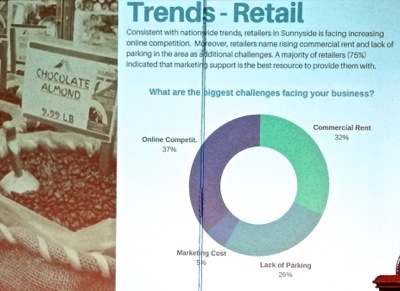 What keeps Sunnyside businesspeople up at night? Over a third of respondents [37%] said they were being adversely impacted by internet competition. Just under a third said that the fast rising commercial rents were impacting their business models. About a quarter said the lack of parking. Jaime returned and told us that she was pleased that Amy would be returning to work for the BID in some capacity beginning in April of this year. Jaime returned to the podium and took us through the financials, which I found rather impressive. The Sunnyside Shines BID generated about a third of its operating budget through its programs. And then came the many thanks and awards to all of the people who helped make this happen. Sunnyside Shines BID Board Chairman, John Vogt, was on hand to co-present the awards which I’ll list and which you can view in the photo slide show. 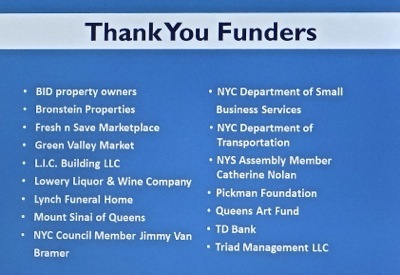 They thanked the funders – see slide. They thanked the partners – see slide. They thanked all the volunteers and gave special recognition to seven of them including Jennifer Abiles, Elder Casares, Sherry Chowdhury, Jonathan Dunn, Ruth Fernandez, Janet Hohenstein and Jessie Oram [see slide show for awards presentations]. One of the volunteers was a former Sunnyside Shines BID employee, Janet Hohenstein, who I have met on numerous occasions. She continues her relationship with the Sunnyside Shines BID to this day in a volunteer capacity, and Jaime and John recognized Janet along with the other volunteer contributors for their ongoing contributions. And a special mention of gratitude was made for Czarinna Andres, a long time contributor, and one of the small business casualties we've seen over recent years. Czarinna owned and operated Bings Hallmark on Greenpoint near 45th Street, which closed its doors last year. Lastly there was the announcement of the slate of newly elected Sunnyside Shines Board Members, many of which are returning and some who are new - see slide. And so it was that the public presentation portion of the meeting had ended. I packed up and began my journey home, thinking about how inclusive the whole event - and in fact the whole year at Sunnyside Shines - had been. I was particularly touched by the recognition award to a longtime exiting member, which treated her – in a sense – like family. For any community, how members going through changes are treated, is an important measure of the people managing things.We are living in turbulent, rapidly changing times and most of us - sometime during the course of our lives - will fall or already has fallen at least once. It’s easier to get back up, when there are people around you who recognize your past contributions and future value, than if you're surrounded by people who don’t - and worse, don't care. In my mind, helping others is what a truly successful BID is all about. And based on that metric as well as all of the other business measures referenced above, the Sunnyside Shines BID - as the headline said - is shining. 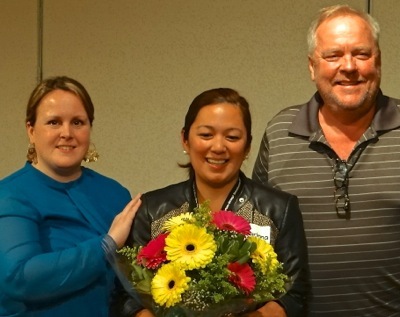 Thanks to all of the Sunnysiders who have been making the Sunnyside BID Shine, with special thanks to Executive Directors Jaime Faye-Bean and Board Chairman John Vogt who are shown in the photo at right with honoree Czarinna Andres.